Nessuna Resa saw the light in Lucca (Italy) in June 2008. In summer 2009 they release a self-produced demo titled "Terra di Nessuno" and took part on the compilation "United Skins for Freedom of Speech" of Oi! Ain't Red Records in 2011. After a three-year stop due to juridical problems with the band members Nessuna Resa record a split album between them and French band Lemovice titled "Tempo Che Non Ritorna - ... Au Bout de la Nuit, au Cœur de l'Ombre..." produced by Black Shirts Records in 2013. After a few month they release a self-titled split album with Italian band Garrota produced by Comunità Militante Dei Dodici Raggi cultural association and edited by Black Shirts Records. 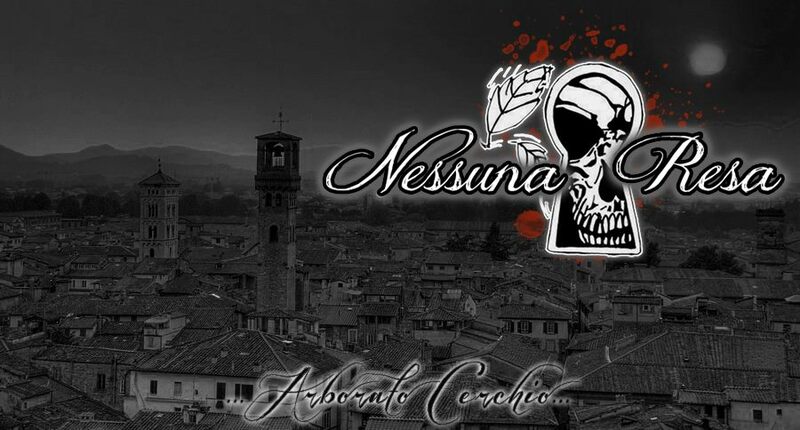 The 13 of september 2014, Nessuna Resa release their first full-length album, "Le Stagioni della Vita", produced by Black Shirts Records. Sadly, now it seems to be a closed chapter for Nessuna Resa. The band's singer was recently sentenced to a long time in prison. We have asked Cico the band's bass player a few questions of what happens now. Hello Cico! I just heard the sad news that the band Nessuna Resa doesn't exist anymore. Can you tell us why? Hi Andreas.Thanks for the interview.Yes, NR doesn't exist anymore for legal problems about our singer and frontman Adam, because he have to spend many years in prison (about 8). Here we have many problems with police and red judges,repression for nationalist are intense. It isn't the first time that we have problems with justice, in the past me and Adam we had to stop the band 2 times because we had to serve time in prison, but every time we have restarted the band. Now it is impossible because of the long time sentence. To bad to hear that. I really thought your band had a really great potential to reach out wide. So this is the end chapter of NR? Will you and the other band members continue with music making? Of the last formation ,drummer continue to play with Garrota, and GianMarco (second guitar) with Onda Nera. Me, nothing for the moment, just Nessun Pentimento how I have just mention. You have some recorded stuff that has not been published. What will happen to this? Yes we have some songs already recorded, 2 of this will go to "7- split with Orgullo Sur.The other songs were meant to go on an other split but the producer abandoned the project. We talk to make a best of with all unreleased tracks and some surprises, but it is just a project for the moment. I hope the song "Non ho tradito" where you used captain Gino Bonola's poem will be on one of those releases? Do you know when the split together with Orgullo Sur will be released? Split with Orgullo Sur, it should have already been released, but for the moment i don't have any news about this. Soon I hope. Thank you Cico. I wish you good luck, hope we will have reason to get in touch one way or another in the future. I leave the last words out to Sweden to you. Thanks for the interview, I really like your country and hope one day to play there. We will met at some gig, thanks for the support and I just want say to all of you "Never surrender", Oi! ain't red!